51.4 cm. x 36.3 cm. “Exhibition purchases gallery canvases.” In Toronto Star, Sept. 11, 1922, p. 1. Jefferys, C.W. Letter to Lawrence Baldwin, dated York Mills, August 16, 1937. 3 pages. Handwritten. 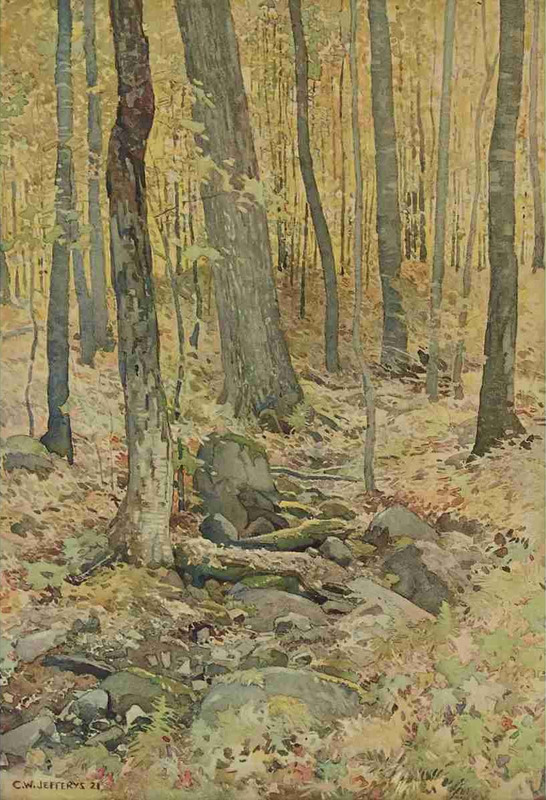 Apparently answering a query from Baldwin [1891-1968, architect, Temporary Curator Art Gallery of Toronto, 1932-] regarding commercial use of “Woodland Interior” by a lumber company for a calendar. Colgate, William. C.W. Jefferys. Toronto, Ryerson Press, 1945. 42 p. Illus. Lives and Works of the Canadian Artists: Charles W. Jefferys, 1869-1951. Toronto, Dundurn Press, 197? folder. Illus. “Journeys Northward: 1914-1936.” In Northward Journal, no. 20, 1981, p. 40-47. Illus. Gibson, Nancy. “C.W. Jefferys: The Artist as Historian.” In The Beaver, Dec. 1990/Jan. 1991, p.6-16. Illus.